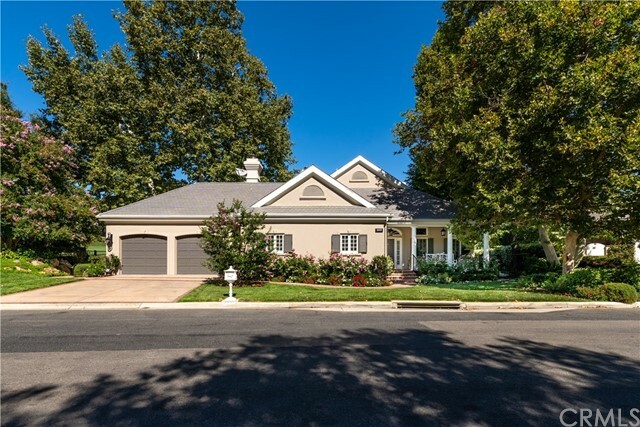 All Thousand Oaks homes currently listed for sale in Thousand Oaks as of 04/19/2019 are shown below. You can change the search criteria at any time by pressing the 'Change Search' button below. "An influencer within Sherwood Country Club, this charismatic estate makes a statement with superb curb appeal. Regarded with today's contemporary design choices, this stunning single-story estate is a one-acre prize within Sherwood Country Club. The supremely private & unique lot features expansive land, distancing all neighbors & echoing the transcendent feeling of living on the 2nd fairway of the world-class golf course. This custom residence is open, stylish & functional with spectacular entertainment spaces that delight the finest of tastes & invites the most discerning guests. The great room & formal living spaces offer hints of sophistication with a casual elegance & entertaining year round is a four seasons delight. The gourmet kitchen has peaceful energy, a creative space to fill hearts & satisfy gourmet cravings. A spacious carriage house accommodates extended-stay guests. Discover ultimate rest beneath the shaded patio, looking over the rolling golf course as the sun cascades through the trees. The initiation fee for the Sherwood Tennis Club OR initiation fee for the Lake Club Golf Membership (Buyer's choice) along with a Golf Cart are included with the purchase of the home." "Behind the gates of exclusive Los Robles Hills Estates w/jetliner views of Conejo Valley, is this gracious, Traditional custom estate sited on nearly 2/3 of an acre designed with each room facing into courtyards or patios for ultimate California indoor-outdoor living with 3 fireplaces, wired stereo system, cook's kitchen w/Thermador appliances, all bathed in natural light from the custom Pella doors, windows and skylights. The single story gem has been lovingly maintained and recently painted with views of the citylights, and mountains, and is walking distance to Los Robles Trailhead. Front row seat for fireworks. Master suite has light-filled en-suite bathroom and big walk-in closet. With fewer than 25 homes in the community, this home enjoys ultimate seclusion and privacy while still being connected to the neighborhood. Freeway close with the quiet and serenity of the country. Award winning schools; largest # of parks & hiking trails for city of its size." "'First floor Master' in this Small enclave of custom homes tucked in the foothills of Thousand oaks. This well thought out floor plan was custom designed for long time family enjoyment and is on the market for the first time. Every room is generous in size. The Master Suite is on the first floor with two walk in closets, fireplace and French door to the outside. There are 2 additional bedrooms suites on the first floor as well. Upstairs are 2 large bedrooms, 2 baths and an enormous bonus room with a balcony overlooking the backyard and beautiful open space. Storage is absolutely not a problem here! The Family Room has an entertaining wet Bar and open to the backyard. The Formal Dining Rm is ready for a large party and opens the patio. Surrounded by beautiful Oak studded open space the yard is private and peaceful yet invites hours of fun. The large patio overlooks the remodeled pool/spa with its dramatic water features. An intimate sitting area has the soothing trickle of the fountain. A grass play yard and a basketball hoop just round off the fun. This is truly a very special property."